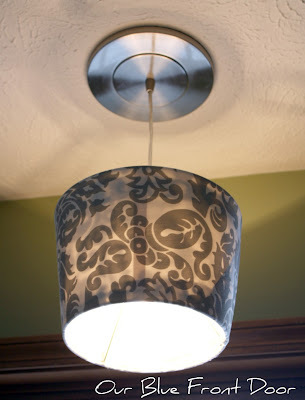 overhead lighting in my kitchen, maybe? resist using the beautiful fabric I found at Hancock Fabrics. okay with it. It's not very easy to measure the inside and get it just right. 1. 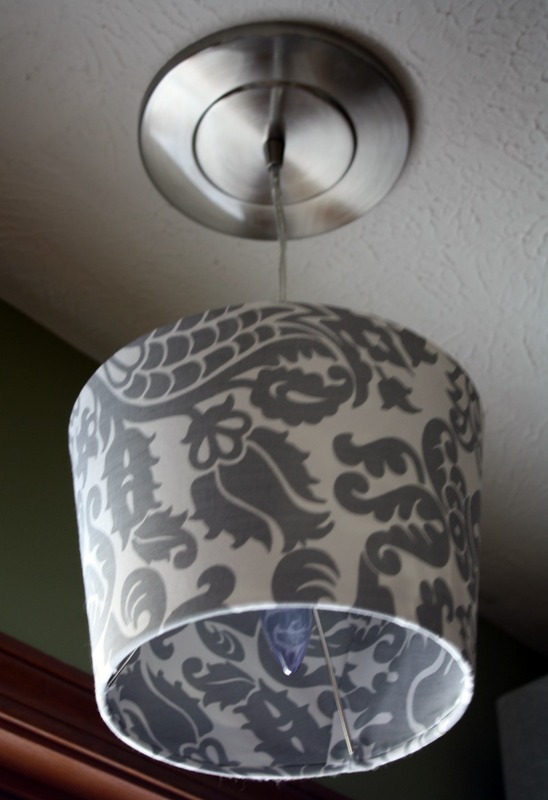 Trace a pattern of the lamp shade and cut it out. Add an extra 1"-1 1/2" to it to allow for folding the fabric over the top and bottom of the shade. 2. 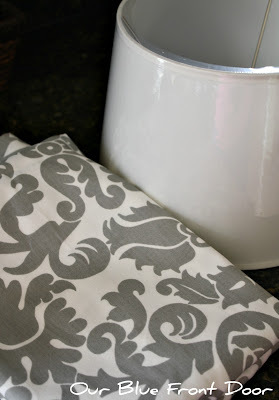 Turn your fabric over with the good side facing down and place your pattern on the fabric. Trace around the pattern. 3. You should be able to see the lines for an accurate cut. 4. Once it's cut you can start working with it and wrapping the fabric around the shade. You want to make sure there's enough fabric on the top and bottom. 5. You still with me?? 6. Time to glue, I used spray adhesive glue and slowly worked my way around the shade. 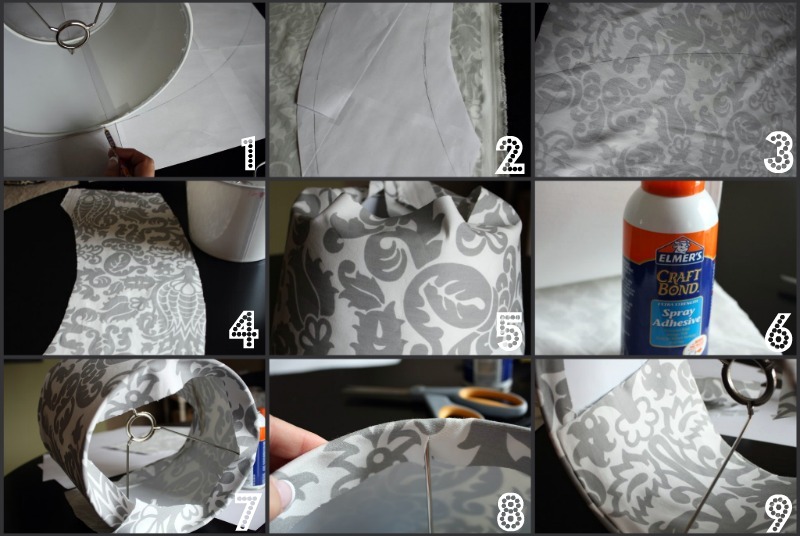 Be sure to glue it on in small sections to alleviate wrinkles and smooth the fabric out as you go. It does go on easy, but it comes off too if you make a mistake AND I did. 7. After the fabric is glued on and set, I used a glue gun for the rest the project. Fold over the extra fabric on the top and bottom and glue it over the edges. Again it's not perfect, but adding the fabric to the inside helped cover up my mistakes. 8. FYI...I used my scissors to cut a small slit for the fabric to fit over the wires. 9. 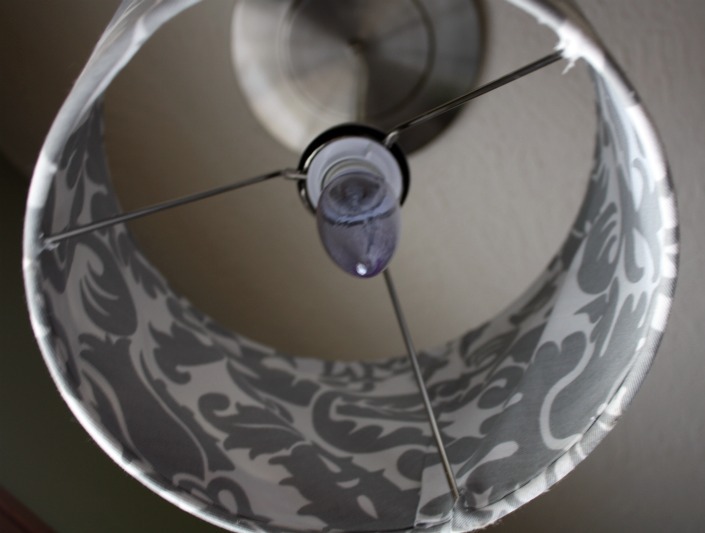 Finally I measured the best I could and glued the fabric inside of the shade. I folded the edges over for a cleaner look and I think it made a big difference. Voila your done! how darling is THIS! love the colors - so elegant! Oh this is fabulous and I love the fabric...Yep, grey is the hot new color and you're on the cutting edge! Wow. This turned out great and I know how hard it was to get it right. 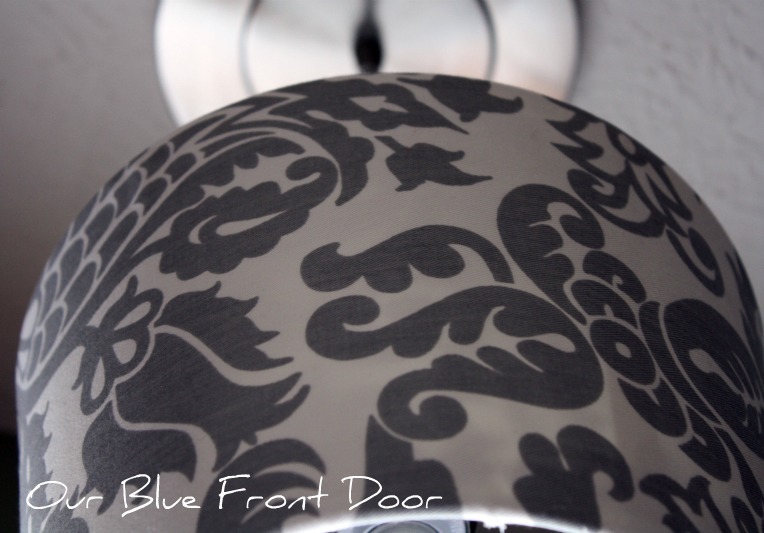 Everyone makes covering a lamp shade look so easy but I, for one, don't think it is! The fabric is to die for. Happy Sunday! Hi Andrea! You did a fabulous job covering that shade! I love the fabric! Looks great! It looks great! Love the fabric and love that the drum is upside down - very unexpected!! Thanks for sharing at Simply Klassic Home! I love your new light fixture! I wanted to let you know that I have given you the Liebster award. Congratulations! For more information, go check out my post today. Andrea- this looks awesome! I'm so impressed! Just a great post on the kitchen decoration! A perfect lighting for a kitchen is the most essential. Apart from the flooring, wall decoration, cupboard design etc. 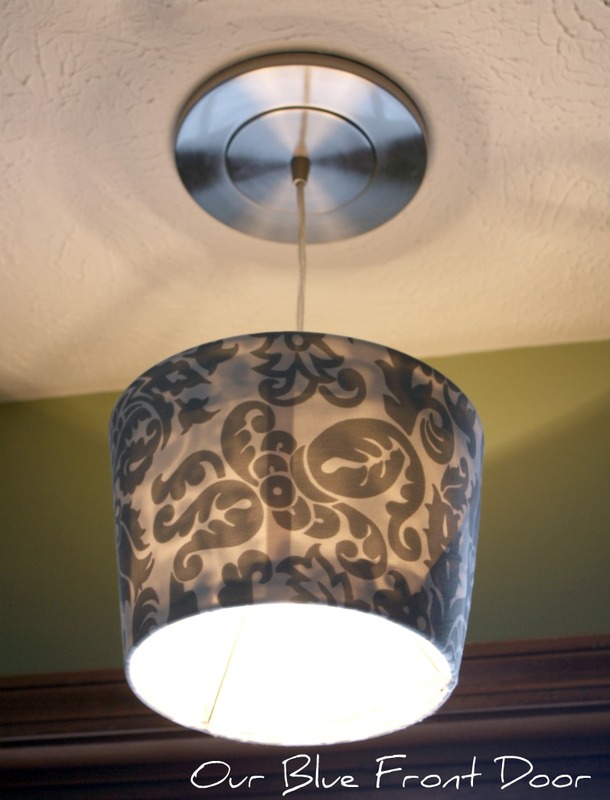 the lighting is another important aspect for a kitchen. Thanks for your step by step guidance on the light design. Really helpful! Check out more exciting ideas for kitchen renovation at kitchen renovation San Diego, CA. You'll love it.